Welcome to Talkshow Thursday. Ruth Brown (fictional war correspondent) reporting on the unusual use of dogs by the British in their efforts to win the war again the Germans. Reports are conflicting as to when the government began its war dog training, but by 1942 several locations had been created. British War Office sent out appeals over the wireless asking dog owners to lend their pets to the war effort. Because of rationing and the dearth of food, it wasn’t long before the Office was overwhelmed with dogs. (An interesting aside: because of anti-German feelings, German Shepherds were renamed Alsatians). After approximately two months of intensive training, the dogs were used to locate and identify landmines, and keep watch and warn about enemy troops. The animals were also used as guard dogs at airfields, ammo dumps and prisoner-of-war camps. The Royal Society for the Prevention of Cruelty to Animals, the National Canine Defence League and the Animal Protection Society of Scotland and Northern Ireland cooperated in the recruiting of dogs, as well as made the arrangements for exams and registration of the animals. Troops often parachuted behind enemy lines. The Army soon realized that in order for the dogs to accompany the men, the animals would need to be delivered the same way. 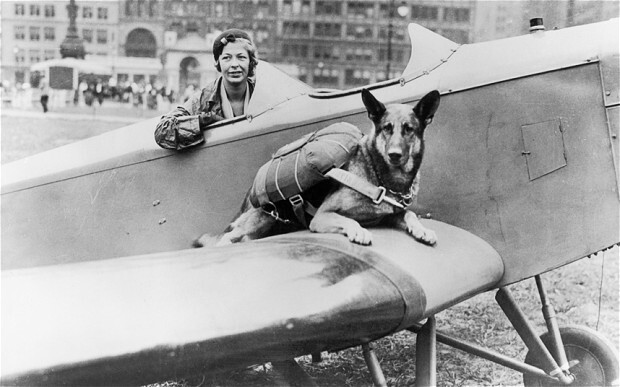 Training the dogs to leap from the airplanes was challenging because of the canines innate sense of self-preservation (I’d hazard a guess a large percentage of the men felt the same way!). 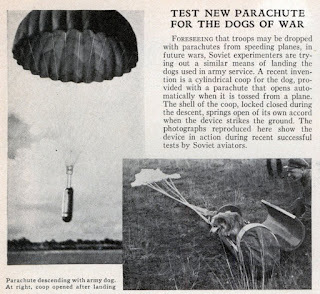 Eventually, the dogs learned they would be rewarded with a piece of meat upon landing. They were also trained to become familiar with (and unfearful of) loud noises and the acrid smell of cordite (the explosive powder in bombs). At the end of the war many of these gallant dogs were awards the Dickens Award – often referred to as the animals’ Victoria Cross.